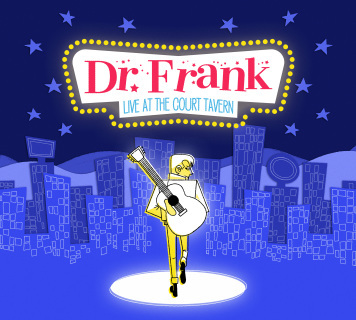 It's Dr. Frank "Live at the Court Tavern" 7-inch flexi! We put together probably the most ridiculous 7-inch flex package ever! This package includes a customized box, white flexi, full-color insert, 1.5" enamel pin, and 5" x 5" full-color sticker--plus a free digital download of the 7" via email (sent within 12 hours). There is just so much stuff crammed into this package! But there's more! We are also offering the Dr. Frank "The Grooviest" t-shirt for $15 w/ this package (SAVE $5.00). Save 30% on ALL Dr. Frank Merchandise on Valentines Day! Enter Coupon Code: GROOVY at checkout and save 30% off all Dr. Frank merchandise! Valentine's Day only! 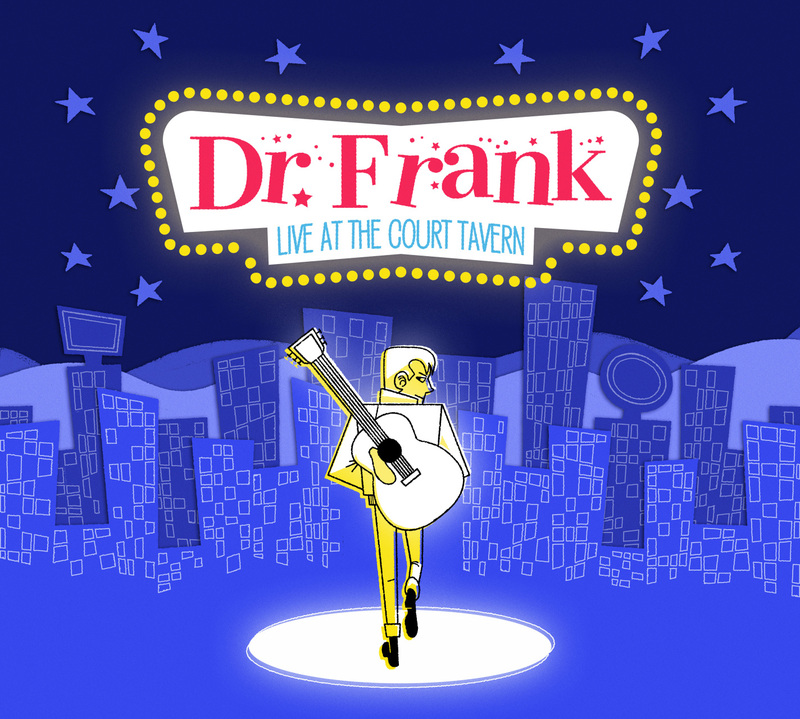 Dr. Frank to Release Limited Flexi "Live at the Court Tavern"
We are stoked to announce that Dr. Frank will be releasing a solo live flexi 7" entitled "Live at the Court Tavern." This month we will be slowly unveiling this project, which will be highly limited and only available through mail-order. To find out some more cool fact about the release, you can check out our Discogs page. Dr. Frank returns with a ultra-limited flexi 7". 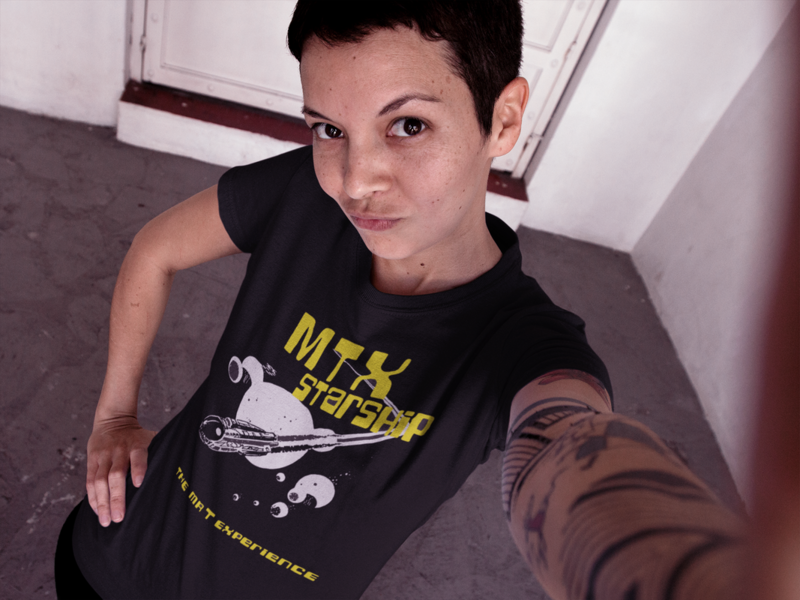 Well, 90% of the MTX Starship t-shirts sold within the first 6-hours of our offer. Needless to say there were a few people who were bummed about not being able to get a shirt in their size. To make sure everyone gets a shirt, we've decided to do another custom order. If you missed out and want to order a shirt simply fill out the form below. On Friday, January 25th, 2018 we will send you a link to order. These shirts will be priced at $20.00 and includes a 1.5" enamel pin and 4" x 4" sticker. But wait, some of you were hoping to we'd do another run of our MTX Starship hoodies. Fear not! You can also order a custom 2 sided print hoodie printed on a District Jersey Full-Zip for $35.00. These are California style hoodies (not super-thick, but not super thin). These hoodies are perfect to wear under a jacket in winter and on their own in spring and summer. Why California style? Because that's how Dr. Frank wears 'em, baby. ​Note: This custom shirts will ship about two-weeks after our initial mail out. The MTX Starship Returns for the first time in over two-years! We've printed up a run of 50 MTX Starship t-shirts in assorted quantities and sizes. And beginning at noon on Monday, January 21st, 2018 they will be available on our webstore on a first come, first serve basis. Once they run out, the MTX Starship flies off for another intergalactic excursion. This classic two-color MTX design is printed on a Next Level 3600 (durable looped cotton) t-shirt. It's so comfortable! This t-shirt will be sold with a killer 1.5" enamel pin, and 4" x 4" sticker included. All for $20 bucks! We’re putting together a Mr T Experience “best of” type compilation, and we’d like your help. What songs should be on it? Go over to Sounds Radical to vote for your choices — they’ve got a “ballot” that lists the entire discography with check-boxes by each track. I’ve got some ideas on it, but narrowing the entire catalog down to a single (well, double) representative album is actually not such an easy task. We say “best of” because that’s the conventional term, but ideally what we want is an encapsulation of the broad sweep of the material, which, for good and ill, covers quite a lot of ground. Sort of like Hot Rocks, I guess. A “retrospective” if you will… or at least a trip down memory lane. (Unlike the actual Hot Rocks, it won’t be chronological. I want to sequence it as an album rather than just an archive, but there are lots of ways to approach that. Themed sides? Ascending, then descending, keys? Try to “tell a story”? Like I said, lots of ways.) Read more. Merry MTXmas! Discounts, Freebies and Packages Galore! Merry MTXmas! We've put together some amazing discounts, freebies and packages for customers new and old alike! Now through December 4th, 2018 save 20% off all items on the Sounds Rad webstore using the coupon code: MTXMAS at checkout. That's not all! All orders over $20 receive a choice of a MTX Forever or Dr. Frank ornament (just add your preference in the instructions at check out). Mr. T Experience (MTX) is set to release the "Shards" collection. This double CD set contains both Vol. 1 and 2 of MTX compilation of once scattered B-sides, demos, covers, and rarities--all given new life with mastering by Lucky Mastering. Coinciding with this release is their highly anticipated 1st pressing of "Shards" Vol. 2 on 180-gram cherry red vinyl both will be out Sept. 14. To complement this new wave of MTX material, Sounds Rad! has worked with the band to produce a whole slew of really cool exclusive merch including a t-shirt, pin, stickers and ... CASSETTES. Now you can listen to MTX "Shards" Vol. 1 and 2 on CASSETTE! The Young Rochelles Release "It's Alive, Too!" Sounds Rad is proud to announce The Young Rochelles, "It's Alive, Too!" (download only) album features 16 high energy Ramones-fueled songs, recorded at NY's The Knitting Factory--it's pure madness! To mark the occasion of The Young Rochelles' first live album, Sounds Rad is bundling a special download of the the recording (including two unreleased Ramones covers, not available anywhere else) with a limited edition glow-in-the-dark t-shirt illustrated by B-Face (Queers, Groovie Ghoulies, Mopes and more). Sign up to our mailing-list.